Barracuda are common and grow to 30kg. They often congregate around inshore reefs. They are not usually targeted by local anglers because they are considered a poor table fish but larger specimens can put up a good fight and frequently jump when hooked. 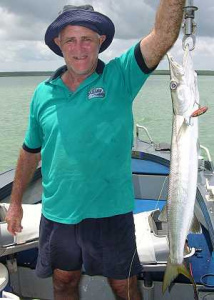 If a barracuda is brought on board, careful handling is necessary to avoid the prominent teeth which it may quite deliberately use on unsuspecting anglers. Location: All round the coast and often close inshore. Method: Barracuda will take lures, flies and baits and are good sport on light tackle. Wire traces help prevent the fish biting through leaders. Eating: Try to release barracuda in good condition – they are very poor eating and have rather grey flesh with an unpleasant odour. Big fish definitely should not be eaten if caught in locations where ciguatera poison is known to exist.